The pioneer project of the Artificial Intelligence Laboratory (AI Lab) at the University of Zurich started six months ago, with the target of developing one of the most modern humanoid robots within nine months. 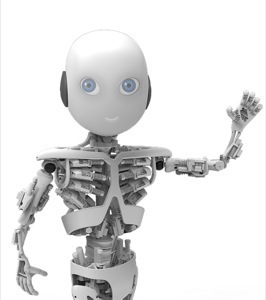 And, on 9th March 2013, Roboy will be presented to the public at the 'Robots on Tour' robotics exhibition held in Zurich on the Lab’s 25th anniversary. The humanoid is a so-called "soft robot” – a further development of "Ecce”, his famous brother, which was also driven by DC motors from maxon. Roboy has been designed as a humanoid tendon-controlled robot (in "normal robots”, the motors are in the joints); this will enable him to move almost as elegantly as a human. As a main project partner, maxon motor supplies various combinations of brushless DC drives to provide Roboy with controlled movement. In total, more than 50 brushless DC motors, combined with gearheads and encoders, have been installed in the robot. Additionally, all of the motor controllers are from maxon motor. To control the motors and execute Roboy's movements, a master/slave motor controller system has been configured. The digital positioning motor controllers are from the EPOS2 series. Programming of the control functions on the slave system was performed in cooperation with maxon engineers. Why use a DC motor controller? Motor controllers: build or buy?